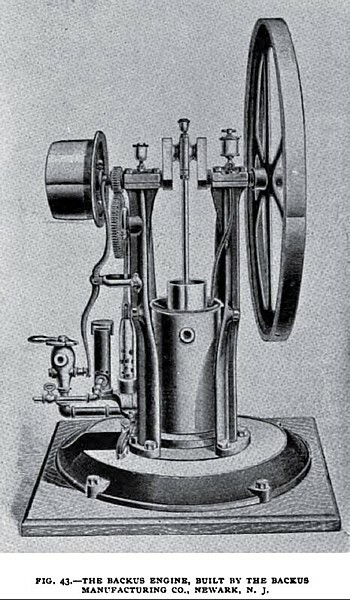 Some uses to which gas engines are especially adapted have been mentioned in a previous article; one of these is the driving of electric light machinery, especially the dynamos of isolated lighting plants, where steam engines with the necessarily attendant boiler equipment are often undesirable. Ease of management and simplicity of power installation in such plants are frequently of the utmost importance and, coupled with the intermittent character of the service required, make the gas engine a prime mover of special acceptability. 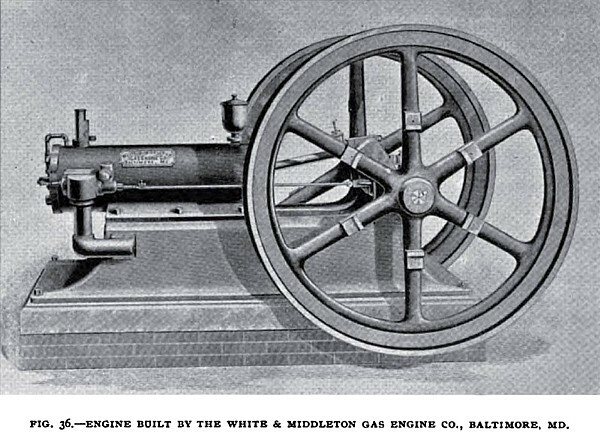 One of the several later types of gas engine which appear to have found much favor for such electric light service is the White & Middleton engine, built by the White & Middleton Gas Engine Company of Baltimore, Md., and illustrated in Figs. 36 and 37, the latter representing a sectional plan. This engine is of the prevailing two-cycle or so-called Otto type to which repeated reference has already been made in connection with many of the engines described in the previous articles. The piston is of the trunk pattern and is connected to the crank direct by the wrist-pin and connecting rod without an intervening cross-head. 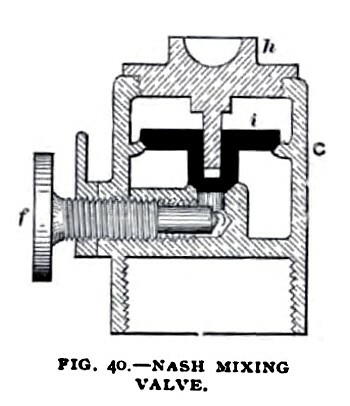 The gas and air are mixed in the chamber a, and the mixture is drawn through the valve b into the engine cylinder during the out-stroke of the piston. During the return stroke the mixture is compressed to about one-fourth its original volume and, at the beginning of the second out-stroke, it is ignited by uncovering the inlet to an ignition tube. The ignition, or explosion, of the charge drives the piston forward. At the end of this working stroke, as it may be called, the piston uncovers the exhaust port f and the larger part of the products of combustion escapes. The portion still remaining in the cylinder, except that filling the compression or combustion chamber on the left-hand end, is expelled, during the following return stroke, through the valves c and d. This completes one working cycle, and the engine is then ready to take in a new charge of gas and air and go through the same series of operations. The valves, it will be noticed, are all of the poppet type. The valve c is worked by the lever g pivoted at h. This lever receives its motion from the rod i and the latter, in turn, is operated by the slide k. A cam is placed on the crank-shaft at l and works with a smaller cam which imparts motion to k. This smaller cam is under the control of a centrifugal governor and a spring, being thrown out of gear with the larger cam whenever the speed of the engine exceeds the normal rate, and thus failing to open the admission valve c and the gas supply valve until the engine has again come down to its proper speed. Ordinarily, when the engine runs under a full load, these valves, of course, open at every other stroke. The valve c always opens slightly in advance of the gas supply valve, the latter being arranged in the casing shown at the side of the cylinder in the perspective view, Fig 1. In Fig. 2 it is not shown. A small valve is fitted to the opening n, and is opened and closed by hand for the purpose of relieving the air pressure in the cylinder on starting the engine. It will be observed that, unlike many other gas engines, the one here shown has no gear wheel combination for reducing the speed for the valve gear, the necessary reduction being effected by an ingenious arrangement in the slide k. The governor also is quite inconspicuous, and the whole engine is very simple in appearance, the number of working parts having been reduced to a minimum. The engine, like many of those already described, is adapted to use gasoline as well as gas. Where gasoline is to be employed, however, the gas supply valve on the side of the cylinder is replaced by a small pump worked also by the rod i. 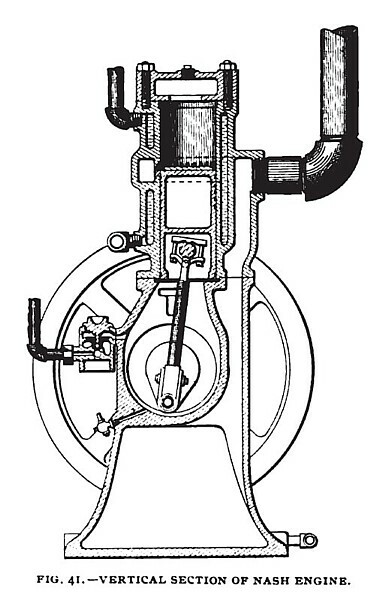 No outside carburetor is employed, but the pump discharges at every other stroke of the engine piston, or less frequently as determined by the position of the governor, a suitable proportion of gasoline into the chamber a, where it is taken up and carried along by the air into the cylinder through the self-acting valve b. The engine is built in sizes of from two to thirty-two indicated horse-power, though arrangements are being completed to turn out larger sizes for which demands have been made. The gas consumption of the engine is said to be remarkably small, test figures being claimed to have shown a consumption of nineteen cubic feet per brake horse-power per hour, in an engine developing actually 5.98, or in round numbers, six horse-power. 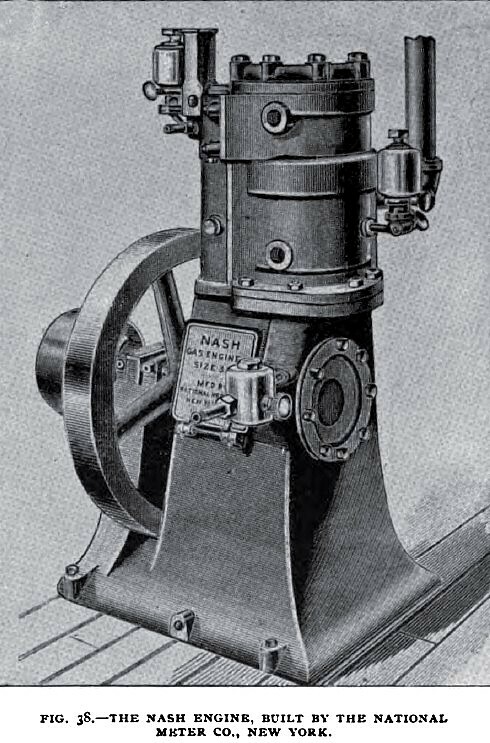 Another one of the later designs of American gas engines, known as the Nash engine, and built by the National Meter Company, New York city, is shown in perspective in Fig. 38. In this engine there is one explosion of a gas and air charge at every revolution instead of at every second revolution, and the engine is thus practically single-acting. The combustion or power chamber is formed partly in a separate hood, as shown in the vertical section Fig. 39, and communicates at one side of the latter with the supply valve port. The forward end of the power cylinder opens into the crank casing which forms a compression supply chamber, the piston being the compressor. 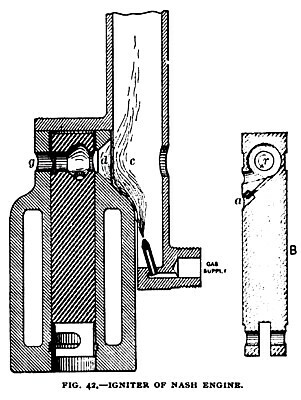 In this chamber work the connecting rod and crank and into it the combustible mixture of gas and air is drawn during the upward stroke of the piston through the mixing valve, shown in Fig. 40, which is placed externally as represented in Fig. 41. This valve automatically regulates the relative supply of gas and air to the cylinder. Air enters through the opening at the bottom, while the flow of gas is regulated by the valve f.
In the interior are two valve ports of unequal area controlled by the double-seated valve i which regulates the flow of gas through the smaller port, and the flow of air through the larger one. It is evident that the relative quantities of air and gas drawn in by the upward movement of the piston will be in accordance with the size of the air and gas openings. The valve i is made of sufficient weight to greatly overbalance the gas pressure so that any slight variations in the latter will not materially effect the proportions of the parts of the mixture. From the supply reservoir the mixture passes upward through a passage clearly shown in Fig. 39. Its admission to the combustion chamber above the piston is controlled by a poppet valve having an ample seat. The quantity of mixture admitted at each stroke is controlled by the valve k, operated by the governor. After ignition and expansion, the products of combustion escape through the circumferentially arranged exhaust openings in the cylinder walls, which are shown in both the sectional views and which are uncovered by the piston at the end of its down-stroke. The igniter b, Fig. 39, and shown enlarged in Fig. 42, is based upon a new principle. The igniting jet of combustible mixture is caused to rotate in the circular chamber r, into which it enters through a passage tangentially placed. This forms a vortex of flame, which is positive in its action and simple. The valve B itself is made of steel, and is hardened and ground to size. It moves in a reamed hole in the case, being so loosely fitted as to drop of its own weight, and yet making a gas-tight joint. Since the valve is perfectly balanced as to gas pressure it moves without friction, and therefore requires a very small quantity of oil—just sufficient to prevent it becoming dry. The valve is made long, and the lower part has a bearing in that part of the case kept cool by a water jacket. As oil is only applied to the lower end, very little can work up to the hot end where the igniter is heated; hence the formation of gummy oil is prevented, and the valve seldom needs cleaning. In actual use it has been found that the case and upper end of the valve never come into metallic contact, as, on account of the looseness of fit at that point, a scale of hard carbon is formed over the surface of each, which protects them from abrasion. The valve is positively operated by an eccentric on the shaft. As already stated, the engine ignites each charge at each revolution, and the amount of the charge is controlled at each stroke by the governor, so that the regulation is as close as for a steam engine. An examination of a card taken from this engine shows a remarkable resemblance to the card of a steam engine. The pressure at the beginning of the stroke is moderate, and the line of the expansion is well sustained throughout the entire stroke. The flywheel is stationed between two bearings formed in the single base casting; hence the alignment of the shaft is always true. The working parts are enclosed and protected from dust, and at the same time they are readily accessible by hinged covers. The engine is made in sizes of from one-third actual horse-power up to four horse-power, and, like all others of its class, is adapted to a wide variety of work. A special engine and pump combination, put on the market by the makers, has met with much favor and is widely used. Gasoline can be used with the engine as well as gas, but in that case, of course, some kind of carburetting device must be employed which forms an independent adjunct. The Backus engine, made by the Backus Water Mfg. Company, of Newark, N. J., is shown in Figs. 43 and 44. It is a vertical engine, made for small powers, and, like several already described, works according to the Otto cycle, there being one explosion in every two revolutions. Fig. 44, which represents a vertical section of the cylinder and valve mechanism, will help to clearly explain the functions of the several parts. The gas, coming through a special gas regulating valve, shown at the left in Fig. 43, enters at a, and, mixing with air, enters the engine cylinder through the admission valve b. 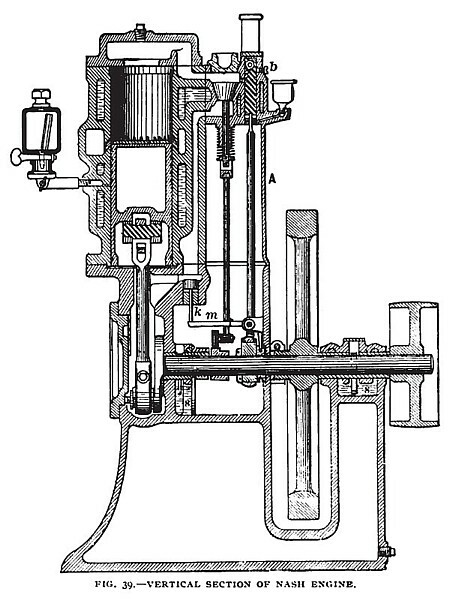 This valve is ordinarily held down on its seat by a helical spring, not shown in the illustration, but lifts during the upward suction stroke of the piston, opening communication between a and the cylinder. Above the valve b is the exhaust valve d, which also is held to its seat by a helical spring, except when opened by the action of the exhaust valve rod which is operated by a gear wheel running at half the speed of the crank shaft. The exhaust pipe is indicated by the dotted circle above the valve d.
When the piston makes its first upstroke, the valve b opens and the explosive charge is drawn into the cylinder, the exhaust valve d being closed. On the following down-stroke compression takes place, both valves b and d being closed. At the end of this stroke the charge is in such a state of compression that it becomes ignited through that portion of it which has entered the incandescent ignition tube c. The piston is then forced up, doing useful work, and during the next down-stroke or exhaust stroke, the valve d is open and the waste gases escape. The engine, after this, is again ready to recommence the same cycle. The governor, which is of the centrifugal type, is arranged in the belt pulley shown at the upper left-hand corner of Fig. 43. As the revolving B weights of the governor move outward under the influence of centrifugal force they move the upper end of a centrally pivoted lever, shown in the perspective view. 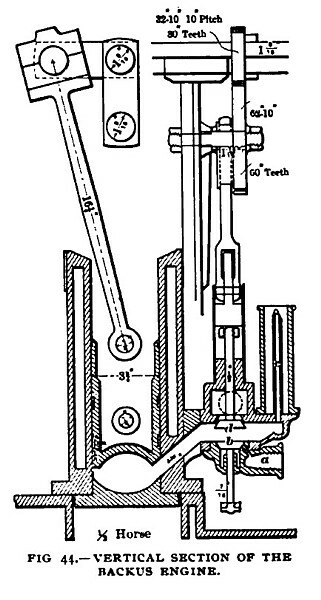 The lower end of this lever is attached to the gas valve, which is thus opened or closed more or less, depending upon the engine speed and the corresponding position of the governor weights. At the lower end of the lever there is also a knurled collar, by turning which the connection between the lever and valve can be either shortened or lengthened, and the speed of the engine can thus be changed while the engine is in motion. The engine cylinder is provided with the customary water jacket to prevent overheating. The sizes of the engine range from one-half to three horse-power.